A new rock wall is helping improve the quality of life for some local physical and emotionally-challenged students. ‘’It’s giving the kids an opportunity to become physically fit without competing,’’ says Kristin Dunker, Director of VASE (Vermilion Association for Special Education). 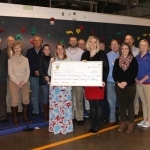 Students at Middlefork School and the Vermilion Association for Special Education have the wall thanks to donations from the Danville Sunrise Rotary Club, Danville AMBUCS, and the VASE Foundation. Dunker says it is difficult for students that have emotional challenges to regulate their emotions during competitive games. The rock wall allows students to set personal goals and work towards meeting those goals. The Danville Sunrise Rotary Club sold cookbooks as holiday stocking stuffers to match a grant requirement. Late last week the Sunrise Rotary Club presented a check to VASE for $4,200.